I loved to paint as a child and still enjoy this hobby in my adult years. I find it relaxing, it calms my mind and helps to re-focus my mind when I am feeling stressed or overwhelmed. It is one of my go to activities in my toughest moments. I have always encouraged my children to be creative, to get their hands dirty with paint and to let their creative side flow when they paint. While they may not have developed the same passion for art and art history as their Mom, they love to paint for fun. The only drawback? The mess! Kids have this amazing way of spilling paint, spilling water, dripping paint on the table – I could go on with this list but I am sure you know this story? And then there is the set up of the entire paint station and then the clean up! It can sometimes take more time to set up and clean up a painting session for your child then the actual time they have actively spent painting. I know at times this has deterred me from whipping out the paint and getting creative with my kids because let’s face it, who has all of that extra time? 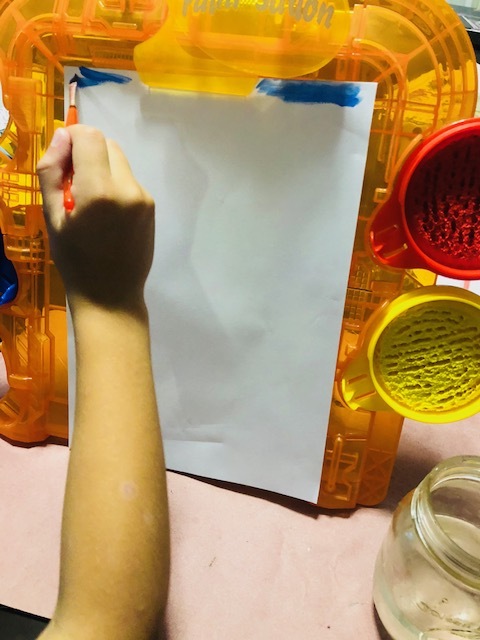 The Paint-Sation Easel was designed in mind for busy families who want to encourage their child’s creative side but want to eliminate the amount of time they spend setting and cleaning up and the mess in between. We all want to have fun and paint but between work, school, extra-curricular activities, we may not have the time nor desire to put into activities that can be messy for young child. This easel eliminates all of that – the set up is easy and there is NO mess. 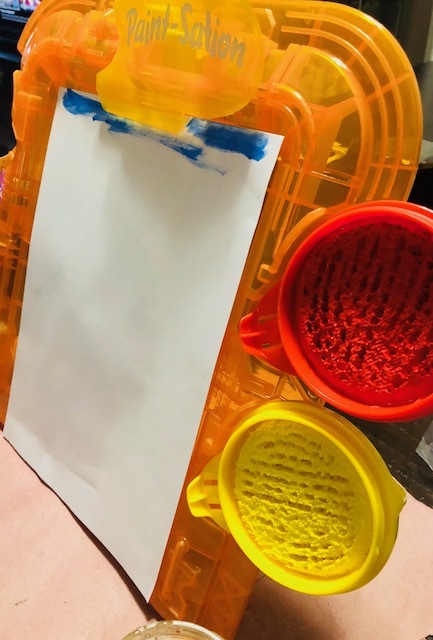 The easel breaks apart into two halves and was quite easy to assemble – it was a simple connection on both the left and right side that our youngest child could pop together on his own. The paint pods attached to the sides of the easel (it can hold up to five) but it did not throw off the weight of the easel or make it tilt or fall to one side. The paint pods themselves are the real miracle workers, they are completely drip and spill free. Yes you heard that correctly – drip and spill free! I was amazed by this, I couldn’t quite figure out how they contained that much paint but it never dripped out even as we had it attached to the easel and at an angle that any other painting pod would have spilled everywhere at. The pods almost appeared to have bristles in them that helped hold the paint in but we weren’t entirely sure what they were (and trust me we tried everything to figure it out!). 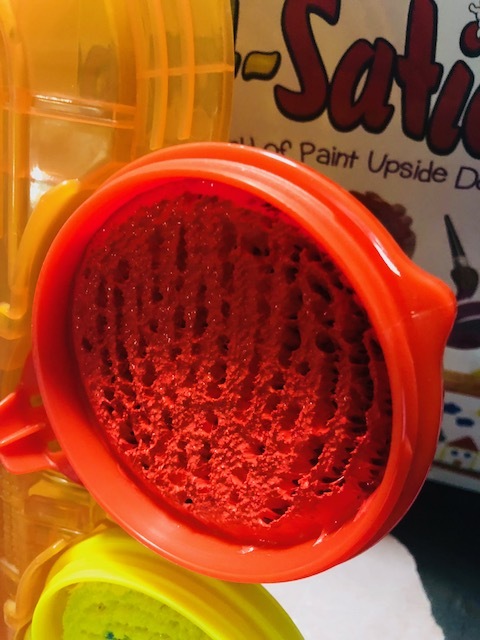 It did not affect our child being able to get enough paint on his paintbrush in order to paint which I thought may happen as it is designed not to drip or spill. The Paint-Sation Easel was a huge hit in our house both for our son and for us as parents. We were a little anxious at first and still put paper under the easel but not one drop was spilled from the pods or from the easel onto the paper. It made cleaning up a dream – the pods were covered back up, easel broken down into its halves and back into the box it went for his next paint session. We have never had such worry free, easy and fun painting time together before. 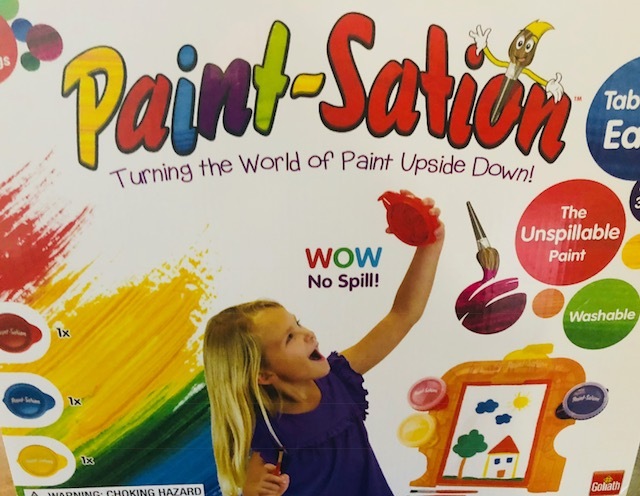 The Paint-Sation set is every artistic parent and child’s dream come true! Learn more about the Paint-Sation Easel on the Goliath Games website. Make sure to follow them on Twitter and Facebook to keep up to date with the newest activities, games and more. Disclosure: I received the above mentioned product in order to facilitate this review. All opinions expressed are my own. This entry was posted in review.